Magento is an e-Commerce leader which powers more than 130 000 stores. Shopping cart conquered its market share because of numerous features, large and helpful community and regular updates. However, Magento requires medium or high technical skills to manage a store. Thats why some e-merchants decide to move their Magento to PrestaShop, which is easier in administration. 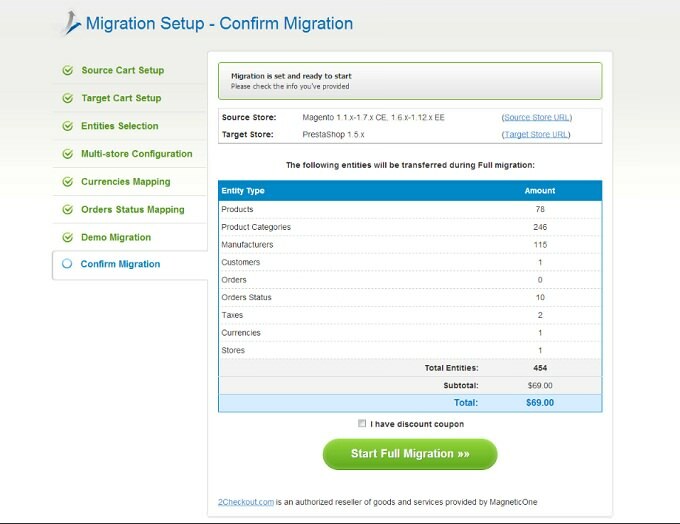 Cart2Cart provides the unique opportunity to perform Magento migration in 10 easy steps. 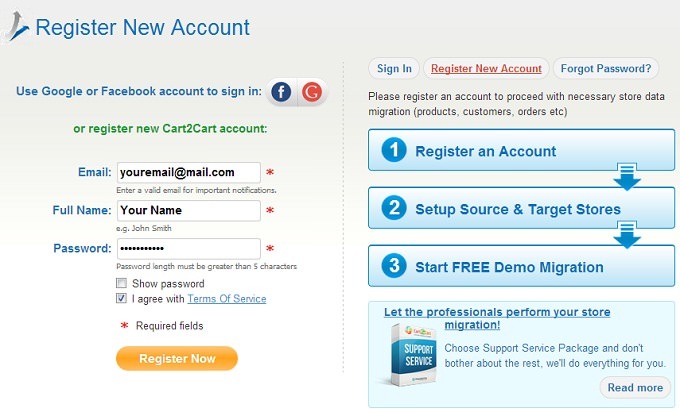 You can sign in with Google or Facebook account or register a new Cart2Cart account. 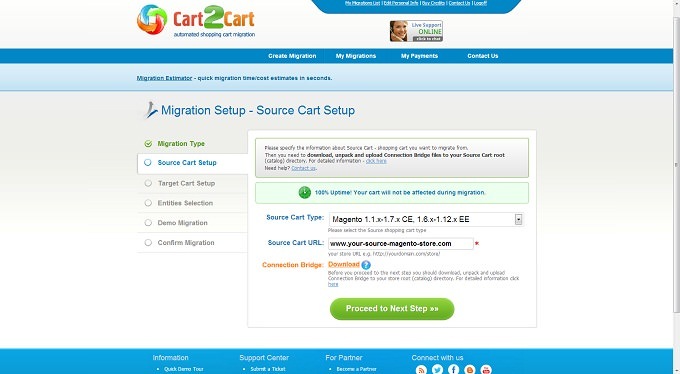 Select your Magento as Source Cart. Then enter your present online shop’s URL. After that, you have to download a Connection Bridge on your computer. Extract it from the archive and move to the root directory with the help of FTP (FileZilla or Total Commander). If you face some difficulties during this process look through our FAQ What are the Connection Bridge files and how to download them? 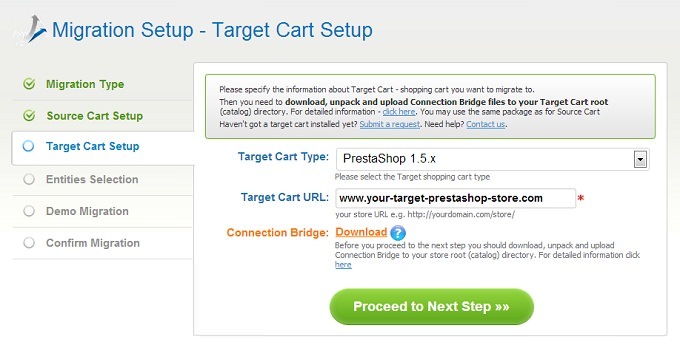 To do that you have to pick PrestaShop from the drop-down menu as you did on the previous step. Then enter target store’s URL. Next you have to repeat the same procedure with Connection Bridge. Now you have to choose entities, which have to be moved to PrestaShop store. Just put a tick near item that have to be migrated or check all. There also is a possibility to choose additional options. 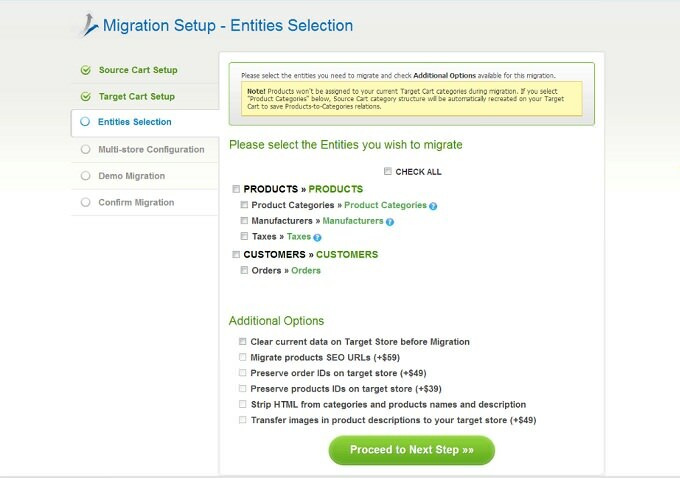 Note: For Magento to Prestashop migration it is possible to move products and products categories SEO URLs. 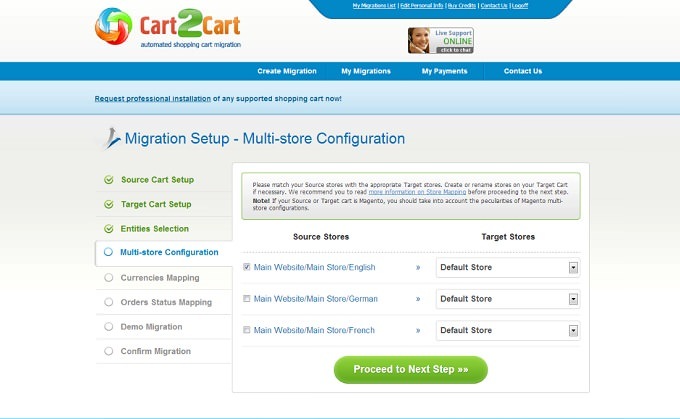 Now you can select target stores that you would like to migrate to one default PrestaShop store. 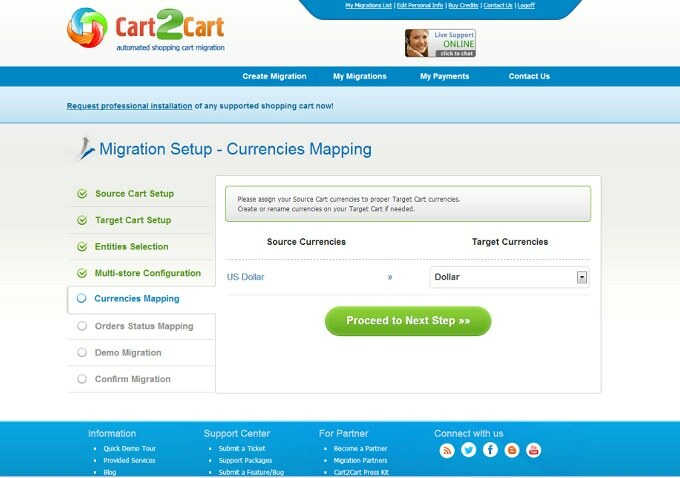 Cart2Cart provides a possibility to map the currencies set in your Magento cart to the ones that will be displayed in the target PrestaShop cart. In a case, you use only one currency, just skip this step. If you’ve chosen to move your orders Cart2Cart gives you a chance to map their statuses. You can change them for better convenience or leave as they are. On this stage, you can check entities once more. 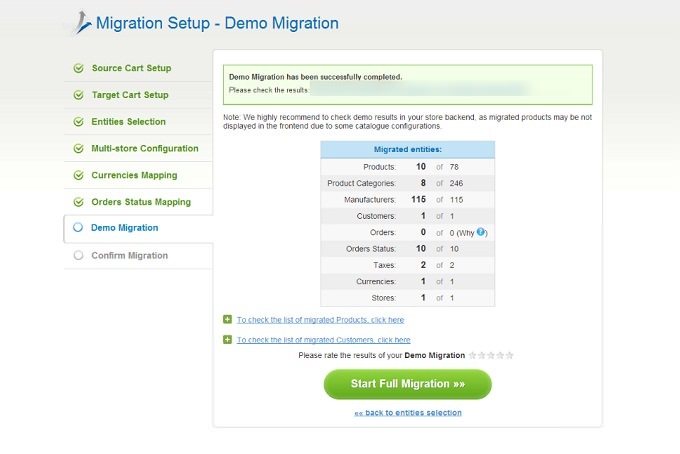 We recommend you to proceed Demo Migration in order to evaluate an outcome. Furthermore, it is absolutely free and will take you only few minutes. In a case, you want to start migration right away you can skip this step. Now you are ready to start Full Migration. If you have a discount coupon code put a tick in an appropriate field. Double check entities, which have to be moved and press Start Full Migration button. You will be able to track the process right there. 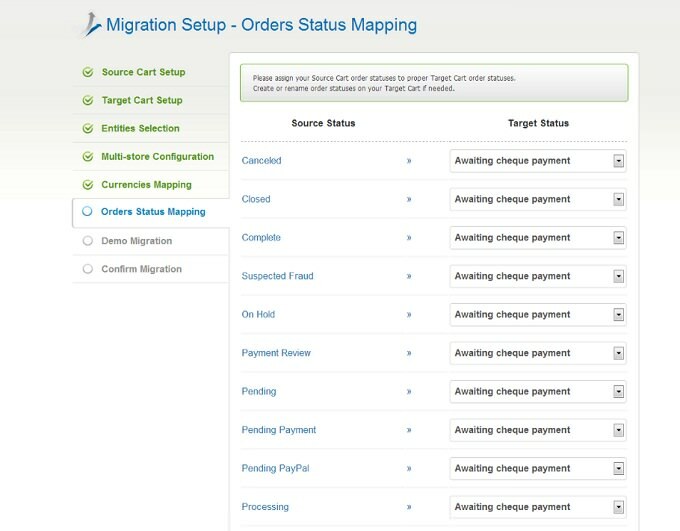 As soon as your migration is completed, you will receive an email notification. All your products, customers and orders will be displayed on your PrestaShop store.